DRAMAFEED took a break because Still Loving You went too makjang as a daily drama not plotted as a revenge drama to destress. But, we are back and still hoping that things will get better for Eunsoo in this situation that does not have an answer. Sooho is aghast and asks his mother what she is saying. At the same time, Eunsoo tells Sooho to calm down and apologizes to Sunyoung for upsetting her early in the morning. But, Sunyoung? She just repeats that Eunsoo should quit her job and stay at home to take care of the chores. Later, trouble hits for Eunsoo. An annoyingly rude customer is demanding a refill with whip cream while Soonjung’s policy is that refills don’t get whip cream. The Team Leader is there and he gets annoyed listening. He interrupts to tell the rude customer to find another cafe and even pulls out a $10 bill to refund her purchase. Soonjung sees stars and hearts everywhere since the Team Leader saved her. She offers to buy him dinner but he excuses himself saying that he had no ulterior motive other than being an annoyed entrepreneur himself. Soonjung laughs that the Team Leader must be extremely shy. Then she watches from the door as he goes to Yeonmi’s dry cleaners. The Team Leader first tries to give Yeonmi a gift since Eunsoo got married. However, Yeonmi refuses saying that it’s burdensome to her. When the Team Leader tries to insist, Yeonmi snaps. She tells him that she thinks of the Team Leader as a friend and nothing more. His actions are making her feel really uncomfortable. So, the Team Leader wilts and leaves with his bag of clothes that are fully dry cleaned… All while being watched by Soonjung who thought that he had a crush on her this whole time. Soonjung is unable to handle the truth that her crush actually liked Yeonmi. She falls into a chair sighing. Meanwhile at work Eunsoo runs into Bitna in the recreation room as coffee times seem to overlap. Bitna muses that living with the in-laws is hard and they might actually end up developing affection for each other if they continue to see each other at home and at work. Instead, Bitna suggests that they unentangle their lives. Bitna will leave the main house and Eunsoo can leave the company. Eunsoo frowns. But, she’s no longer the girl who just listens to Bitna suggest crazy things. She snaps back that if she has to quit, it will be her decision and not influenced by having to make a sacrifice for Bitna’s comfort. Yea! In your face Bitna! Eunsoo thanks Bitna for the coffee and leaves first. At the same time, Soomin and Eunho walk back to Cafe Soonjung after lunch. They find it closed since Soonjung went home to cry over the death of her one-sided crush. As they stand around wondering where to get coffee, Yeonmi pops out her head and invites them into the dry cleaners for some instant coffee and fruit. Over coffee, Soomin tells them not to worry as Eunsoo is doing fine and her father likes Eunsoo. Eunho asks about Sunyoung and, to Soomin’s credit, she does not like. She just laughs awkwardly and comforts them that Sooho is always by Eunsoo’s side protecting her. Our lovely Sunyoung? Gag. She’s laying around on a couch laughing to herself. She decides that Yeonmi did raise her daughter well. But, she wants Eunsoo to stay at home to make her life much easier. Someone toss a bucket of toilet water on this lady! Then, it’s time to face the horrible music. Eunsoo finishes her work and asks the Team Leader if she can leave first. When Eunsoo gets home with groceries, she runs into Soonjung in the living room waiting for her. Soonjung tells Eunsoo to wash all curtains since it’s now spring. Then, after Eunsoo finishes cooking a bean sprout soup, Soonjung announces that she doesn’t like bean sprouts and demands that Eunsoo cook another soup. Eunsoo frowns but forces a smile and agrees. Sunyoung also comes along to announce that all of the guys are coming home late so it’s a girls only dinner. The tirade continues through dinner. 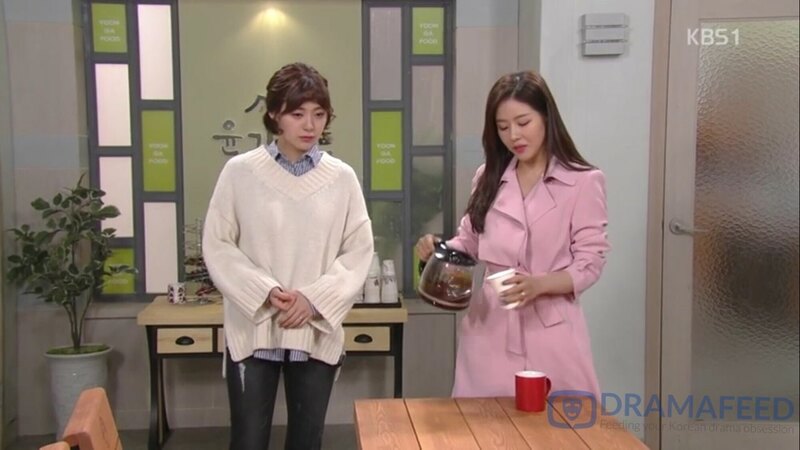 Soonjung finds all of the dishes less than satisfactory and accuses Eunsoo of putting in less effort because she knew Mr. Yoon won’t be joining. Eunsoo denies it and promises to do better. Then Sunyoung attacks asking if Eunsoo thought about what Sunyoung suggested that morning… It’s probably too hard for Eunsoo to both deal with work and household chores. Soonjung jumps in to ask incredulously if Eunsoo is asking them to work. Soonjung and Sunyoung immediately state that they can’t help out with the house anymore. Soonjung even adds that Bitna has studied a lot… It would be a shame to have her stay at home; they should have the less educated person sacrifice. Wait for it. The DRAMAFEED rant will appear below. Soomin actually manages to jump in and weakly add that it’s not fair to say that someone who studied more should work outside the house while someone who studied less works inside. Hear! Hear! But, Bitna joins the fray. She notes that the last time everyone tried to prepare the memorial dinner with Sunyoung, it was a complete mess. It seems logical that the person who is good at household chores takes care of it. Sunyoung and Soonjung approve of this packaged implication that Eunsoo handle the household chores. 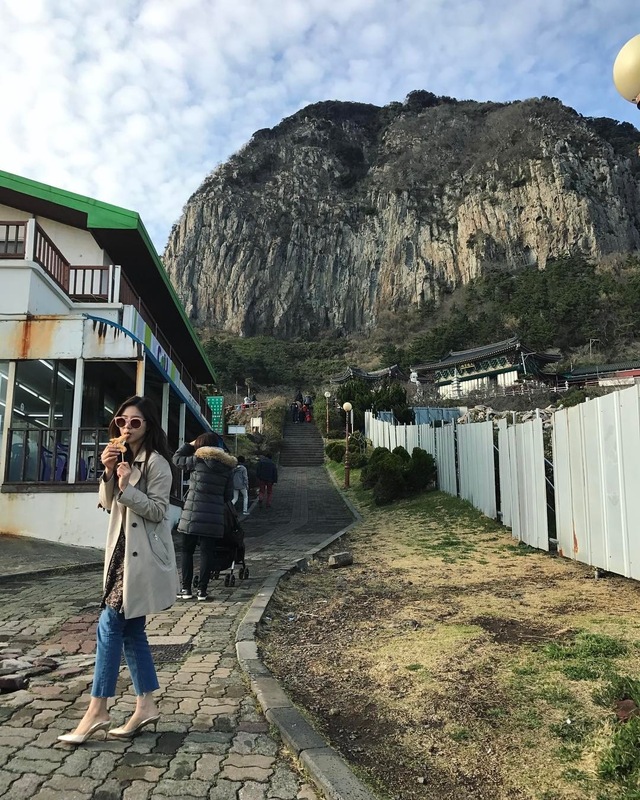 Sunyoung even adds that she won’t be asking for parental allowance; so, Eunsoo can quit next month. Mr. Yoon arrives at the tail end and asks what they are discussing. Cue everyone sitting in the living room having a further discussion. Mr. Yoon tells Sunyoung that she’s misunderstanding something. She is Eunsoo’s mother-in-law but not the CEO of Yoon Ga Foods. Sunyoung whines back that it’s only because she’s thinking about Eunsoo. When Eunsoo was exhausted trying to handle both work and the household chores, she had a nose bleed and Sooho blamed it all on her. (Rightly so if you ask me!). Mr. Yoon turns to Eunsoo and tells her that the decision to quit work is up to her. But, she should not forget that she is an important employee of the company. He also tells Bitna to share the burden with Eunsoo. Then, he turns to his wife to order that she also demands Soonjung and Soomin to help out. Mr. Yoon goes into his room. Sooho comes home and hugs Eunsoo. This annoys Sunyoung to snaps at them for displaying their affection. Eunsoo takes Sooho to their room and asks him not to hug her so much or always be on her side. It makes her embarrassed. At the same time, Yeonmi meets with Jaewoo in the park. She apologizes but tells him that they need to break up. Also, what is up with the discussion afterwards only being between Mr. and Mrs. Yoon, Bitna and Eunsoo? What Soomin does not have any responsibility to cook or clean? Honestly, if this were a truly traditional family, even if Soomin is a doctor and the daughter, she would still be helping out with her mother. The Yoons are picking and choosing what old-fashioned Korean customs that they want to apply to their family. Don’t get me wrong. I am all for modern traditions. But, if we want to be fair… To the extent that Soomin does not help out, she should at least pay for a housekeeper to come once a week. I am sure that I don’t have to remind everyone that Bitna’s actions are still having visible repercussions on Eunsoo’s life but Bitna has not had her comeuppance. Had Eunsoo been a high school teacher, would Sunyoung and Soonjung still insisted that she quit? Probably not. In other words, Bitna’s actions, which she still has not properly apologized for are following and ruining Eunsoo’s life still…after 8 to 9 years. Wow Bitna, good job. On a note unrelated to the plot, I am pretty amazed by the acting in this daily drama. I feel so empathetic towards Eunsoo even though Eunsoo is clearly not an annoying “Candy” that I want to throw into the window. She walks that line where I feel like she is buying her own misery but it’s still not so bad that I want to move on to another drama. As for the actress playing Bitna, she’s got the selfish, rude, prick down to a part. I would love to see her play a different role to see if she can be flexible. Soohyun’s acting feels a bit stilted at some times but that could be because of his character as a stiff/awkward fellow. Finally, Sooho’s sweetness feels very natural and I truly believe that he’s sweet enough to do everything for Eunsoo and Eunsoo is his 100%. Lee Young-Eun with longer hair v. her now. Totally different image, right? Still Loving You Episodes 72 Recap by DRAMAFEED | Copy & Paste Guidelines – Always put a link back to the source.